This independent Trullo lies quiet and sunny, embedded in an olive grove. 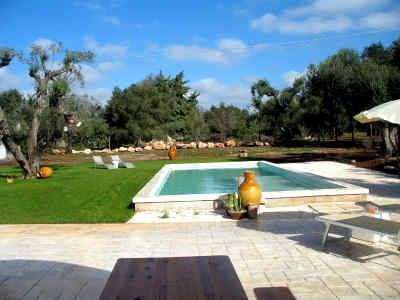 The Trullo was carefully restored by the owners and lovely furnished and offers know space for 4 persons. The roofed terrace offers with table and chairs the possibility for outside lunch. And children have enough place for playing on the property. If you want to spend a holiday in a close contact with the nature the Trullo Votrano is the right place for you. And the characteristic villages like Ceglie Messapica, Cisternino and Ostuni are reachable by car in few minutes. Price includes water, gas for cooking, electricity, bed linen, towels and final cleaning. Payable on spot: Heating (small gas stove, wood, on request) according to consumption, deposit € 100,00.